Data assimilation (DA) holds considerable potential for improving hydrologic predictions as demonstrated in numerous research studies. However, advances in hydrologic DA research are yet little due to the difficulty in the quantification of model and observation uncertainties and in the implementation of techniques where some fundamental assumptions are often not verified. This is a serious limitation since the recent intensification of the human impacts on the hydrological cycle poses the important challenge of the correct representation of hydrological and atmospheric processes with the current state-of-the-art model structures and parameterizations. In a nutshell, as observations are the only way for realistically tracking human impacts on the water cycle, our models need to be constrained more with observations in order to obtain a better representation of the underlying hydrological processes. 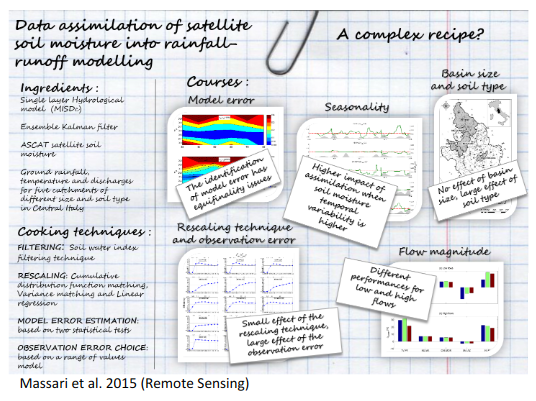 The recent large availability of remote sensing information of soil moisture, rainfall, vegetation, and snow offer a huge opportunity to improve the water cycle description via the simultaneously ingestion of all these products into models. the development of community-based, DA tools for hydrologic applications. In this respect, we are particularly interested in understanding the potential of DA in flood forecasting (Massari et al. 2014, 2015, 2018), drought monitoring and water resource management trying to understand the role played by different factors on data assimilation success (see Figure).